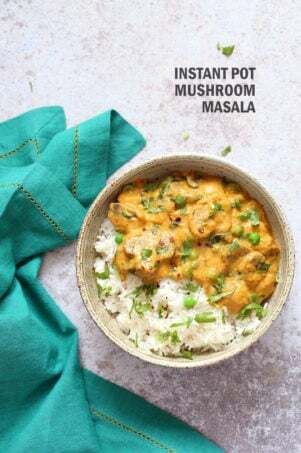 The Stove top version of Mushroom mutter Masala has been loved a lot. It is super easy 1 pot 30 mins as well. But its summer, and no one wants all the heat from the stove in the house. So let make this Instant Pot (pressure cooker) version! The recipe is pretty similar to the stove top version, super quick and versatile. Add some chickpeas or other beans, other veggies if you like and use other spice blends for flavor variations. I have been using baharat blend (recipe in everyday kitchen) in this lately and that flavor works insanely well with the sauce. Berbere would too. My obsession with baharat and berbere continues. If you havent already, make these blends, they are just mixes of spices, common spices for baharat and berbere might need an online order to get some fenugreek (its worth it!, I use fenugreek in many recipes including this one. It usually is used in many creamy Indian sauces for the traditional flavor). Back to the recipe. The sauce is again a blender sauce because who’s got time to chop and mince onion, garlic and ginger. Finely Chop them and use if you prefer(the blended mixture can sometimes turn green on cooking because of old garlic. Its edible, just might add some of the color to the sauce). Then use the same blender to blend the tomato into a puree. Add to the pot with spices and mushrooms and pressure cook. Then use the same blender to make cashew cream, if you dont already have cashew cream or other non dairy cream. Add to the pot after the pressure cooking for best creamy results. Just opened IP with Mushroom Masala. Add non dairy cream, peas and spinach, bring to a boil and serve. Blend onion, garlic, ginger, chile with a few tablespoons of water into a puree in a blender. Meanwhile, blend tomatoes in the same blender until smooth and set aside. Add the spices and mix in. Add the pureed tomato and mix well to pick up and mix the sticking onion mixture so it doesnt burn while under pressure. Add the mushrooms and salt and mix well. (You can add other veggies or 1 cup cooked chickpeas/beans at this point). 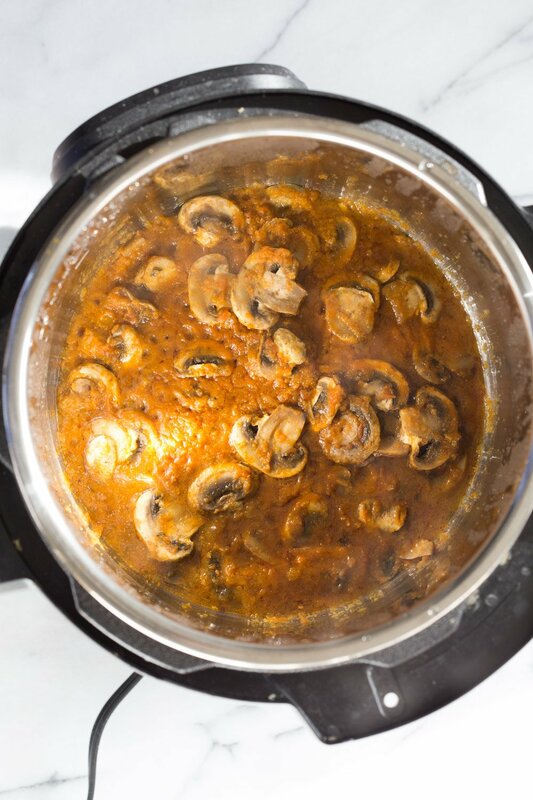 You dont need additional liquid as the mushrooms and veggies if using, will release moisture during cooking. Cancel saute. Close the lid and Pressure cook for 6 mins on high pressure. Once done, Release the pressure after 10 mins. Add the peas, spinach, cashew cream, cayenne if using, and sweetener if using. Put the pot on saute and bring the mixture to boil. Taste and adjust salt, spice, flavor. Cancel saute and serve garnished with lemon juice, cilantro. 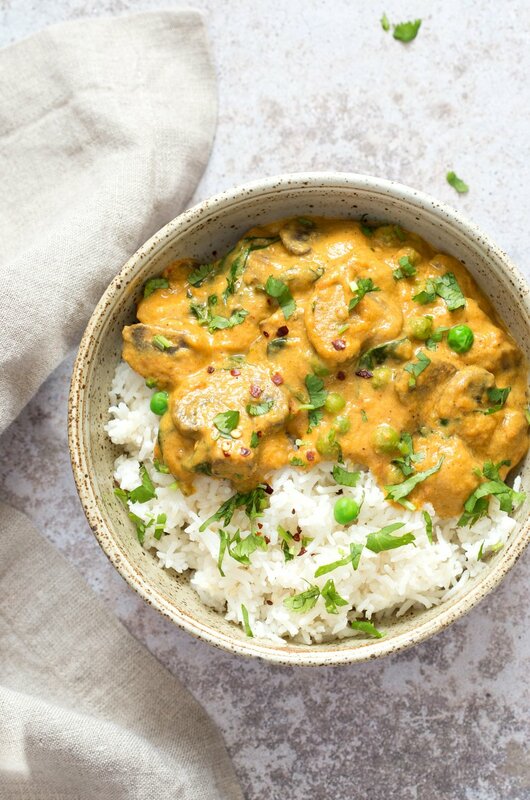 Nut-free: To make the sauce without nuts, use pumpkin seeds or silken tofu to make the cream or use plain unsweetened non dairy yogurt or coconut cream(thick coconut milk from a can of full fat coconut milk), or use just water for a non creamy curry. Fenugreek seeds or ground: Use a 1/4 tsp fenugreek seed powder instead of 1 tsp fenugreek leaves. If you have seeds, grind them and use a 1/4 tsp of the ground. Doubling: Double everything except heat(hot green chile,, cayenne). Pressure cook for 6-7 mins. Amazing Richa!! I love all the substitutes you offer for ingredients and spices…. makes cooking so easy. 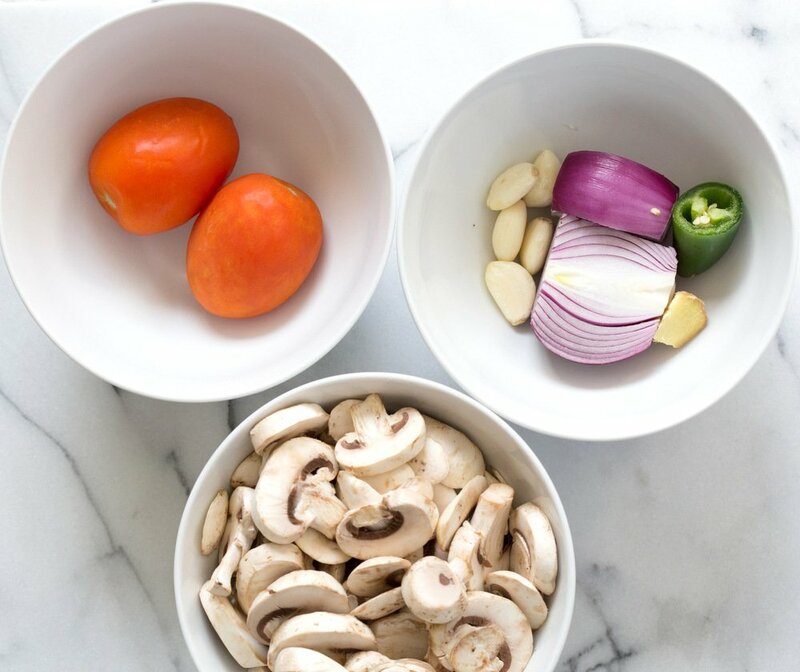 I have enjoyed every single one of your recipes…I’m so looking forward to this one as mushrooms are my fave!!!! . thanks so much for sharing your wonderful recipes! This looks really wonderful — love that it’s made in the Instant Pot! I think I would toast the suggested chickpeas in my air fryer and sprinkle on top! Can’t wait to try this. I tried the recipe – however the sauce turned out better. Sauteeing onions &tomates in steel pot makes it better. the flavor takes much longe to cook out. So it needs a longer roasting time. The bitter flavor can also be because of burning of the onion and garlic which can happen in steel pot. Hi Richa, this summer one year ago, when I ate really tasty Indian Food in London, on my holiday, I promised my family and myself I would learn to cook Indian Food and boy I did. Thanks to you!!! I bought al these fancy spices and started making your recipes. They are so lovely and do-able! Today I made this mushroom masala, with cauliflower and green beans in stead of mushrooms and peas and I used my baharat spices (for the first time). It was so good! We all enjoyed it very much. Thank you for sharing al these delicious recipes! Keep up the good work!!! Thats awesome!! so glad the dishes are turning out well! I tried tofu masala at an Indian restaurant for dinner one evening and absolutely LOVED it. Now, I’m determined to replicate the recipe! This looks almost identical to the dish I had–I can’t imagine the mushrooms not tasting delicious in the curry. What would be the best substitute for the cashew cream? If I were to add tofu, when would you suggest adding it in this recipe? Thanks! Such a delicious recipe! I love that we can make it in the instant pot! The kasoori methi adds such a great taste! Thanks for another hit Indian recipe, Richa! 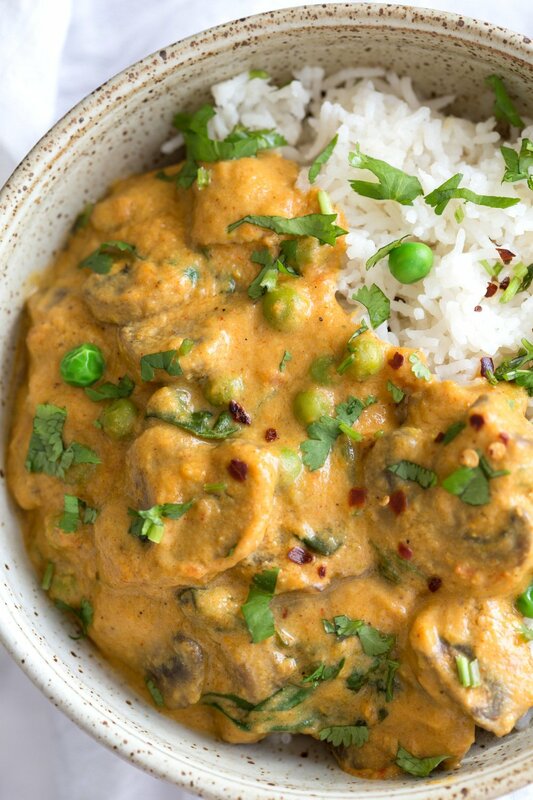 I love methi in creamy sauces. It makes them so complex flavored. I’m interested in your instant pot. I used to have a pressure cooker in the past. This looks similar. Is it? What are the pros and cons of using the instant pot? Is this safer? Faster? Instant pot is a multi cooker. I use it mainly as a pressure cooker. It is a bit safer than stove top versions and older models of pressure cookers. It also has scheduling and other tech options that allow you to plan better, dont need for you to stand there etc. People love the set it and forget it option. Cons would be that the saute option does not allow you to control heat as well as stove top, so for any steps that require some sauteeing, you are better off doing it on the stove then transferrign to the pot. It is also a bit more cumbersome to wash compared to stove top cookers that you can just throw the entire pot in the dish washer. Absolutely delicious. Loved it and will make again. When adding chick peas do you add them before pressure cooking or after? Here most of the restaurants are Punjabi inspired cuisine. It’s quite boring, very rich and non vegan! So I love your “rich” recipes in your books, but my favourite Indian cuisine is South Indian. You said in the “Indian cuisine” section at the end of your book that South Indian cuisine is so large that it would deserve its own book…please write it!!!!! (I know you’re not from South India…but, still!!) :):) Thank you! I have some south indian recipes in the book and on the blog. I think the problem is availability of ingredients which deters people from trying them out. The availability has been getting better, so more recipes will be on the blog! What are the differences between using cashews and pumpkin seeds? I have pumpkin seeds already, but could get cashews as well. Is there a big taste/texture difference? If I double the recipe, should I change the cooking time or use more/less than double of any of the ingredients? Thanks! Cook time remains the same. Use 6 mins. double everything except heat(cayenne, green chile). Use 1.5 times heat to begin with. Absolutely delicious! I add black eyed peas to switch it up a bit from chickpeas and it turned out delicious! Thank you Richa! Hey Richa, was thinking to try this with yogurt instead of cashew cream… how much yogurt to put in? I was thinking of using Kite Hill’s almond yogurt… think it would turn out okay? yes.1/3 cup yogurt shouldbe good enough. Simmer for a few mins so the flavor melds well. I use yogurt in tikka masala sauce. the flavor here will be tikka masala-ish with the yogurt.